Avery Berkel 6103-E22 Portion Scale, 10 lb x 0.005 lb, 7 foot Cable-Swivel Bracket. Avery Berkel 6010-10 Portion Scale, 10 lb x 0.005 lb, 7 foot Cable-Swivel Bracket. The Model 6103 is perfect for use in pizza parlors, sandwich and salad shops, bakeries, convenience stores, delicatessens, restaurants, bars - anywhere portion control is required to maintain product quality and save on ingredient costs. 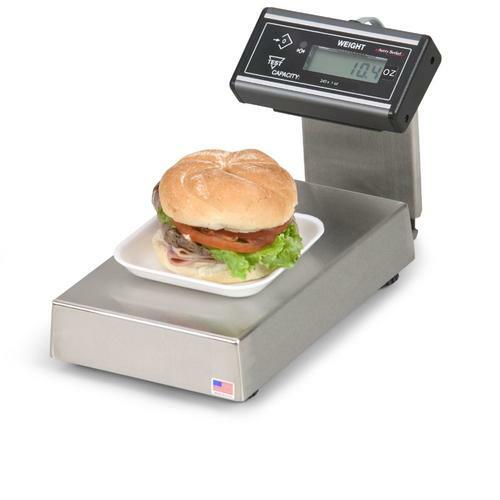 Get accurate weight measurements every time, while the innovative “touchless” zero mechanism increases operator efficiency, greatly extends life of the scale, and enhances food handling safety. Just wave or place your hand over the display to zero the scale. This feature significantly improves hygiene, while eliminating the physical wear and tear on a normal button switch mechanism. Angled six digit LCD display with large 0.5” (12 mm) characters. User friendly interface keeps operation simple and reduces training time. Removable stainless steel platter, detachable display and bracket. Weigh anywhere on the platter – even in all four corners. Stainless steel weighing area with welded corners and full skirt around perimeter of the base. Heavy-duty load cell and load stop mechanism ensures long life. Only 2.5” (64 mm) tall. Perfect for use on top or recessed into prep table. Decimal pounds, ounces, or grams. RS-232 serial output for interface to software programs, enabling inventory control. supply. Standard 3 wire with ground input.